These recipes will give you a good selection to choose from to suit your own personal taste. Roasting the spices brings out their flavour and also makes them easier to grind. 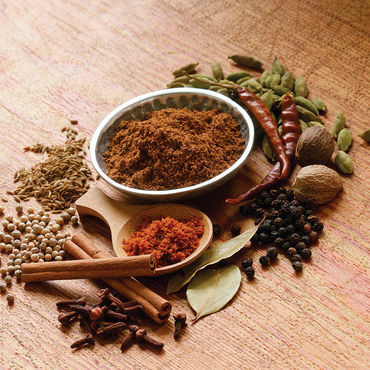 If a blender isn’t available, use a spice grinder or mortar and pestle to pound the spices to a fine powder (when the spices are still warm and crisp after roasting this process is made much easier). Store garam masala in an airtight jar in a cool, dark place for up to 6 months. Freezing may help preserve the essential oils. Roast the coriander seeds in a small frying pan over low heat. As it starts to smell fragrant, remove to a plate. Repeat with cumin seeds, peppercorns, cardamom pods, cinnamon sticks and cloves, cooking separately until all are fragrant. After roasting, peel the cardamom pods, discarding the pods. Place the cardamom seeds in a spice grinder with the other roasted spices and blend to a fine powder. Stir in the nutmeg to combine. Roast the cinnamon sticks in a small frying pan over low heat. Repeat with the cardamom pods, cloves and mace, if using, cooking separately until all are fragrant. Stir in the nutmeg, if using. Roast the cinnamon stick in a small frying pan over low heat. Repeat with cardamom pods, cloves, cumin seeds and peppercorns, cooking separately until all are fragrant. Garam Masala usually contains black cardamom rather than green cardamom. You’ll almost certainly need to go to a speciality market (or order online) to get black cardamom, but it makes a fairly significant difference. I’ve also seen blends that include dried bay leaves that get ground up with everything which can be quite nice.